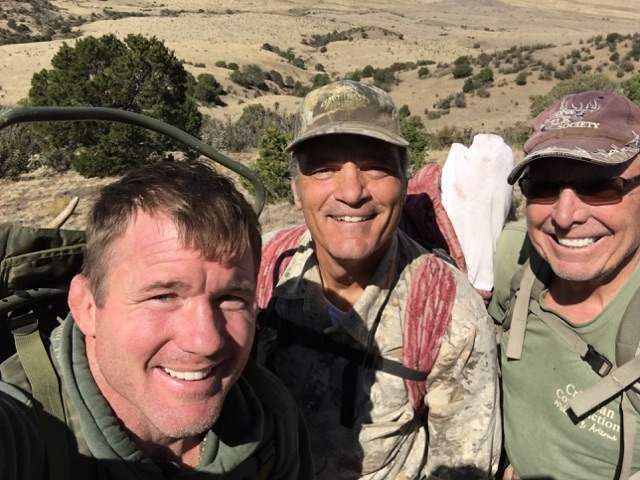 When my friend Matt Hughes called and asked if he could Elk hunt with me this year, I was as excited about the hunt as Matt was. Matt is a World Champion Ultimate Fighting Championship (UFC) fighter and Welterweight Champion of the World, so this meant we were going to hunt hard and high. My ranch in New Mexico has very diverse terrain which allows for our clients to hunt the rolling hills or the steep rugged mountains, depending on their physical abilities. On opening morning as Matt and I were hiking up the mountain Matt told me his goal is to harvest a Non-Typical Bull. “Score means nothing to me, the crazier looking the antlers, the better”. Once we arrived at the first glassing point we began to glass and within an hour we had already seen over 70 elk. We were just about to move up when I spotted a bedded Bull at 300 yards away. “There’s your goofy Bull” I told Matt. Once Matt took a look at the Bull he was sure that was the Bull he came for. We had already harvested Bigger Bulls, but Matt felt like a Non-Typical is just as unique as a higher scoring Bull. Matt laid out and prepared for the shot while I got set up with a scope to view the impact. Matt squeezed the trigger and the Bull rolled over dead in about three seconds. With the help of a couple of my guides we packed out the Bull and returned to the lodge at 11:00AM opening day! Because I had other hunters in camp, Matt asked if he could hang around and help any way he could, so he stayed and continued hunting with me and two other hunters, both of which harvested Bulls in the next two days. 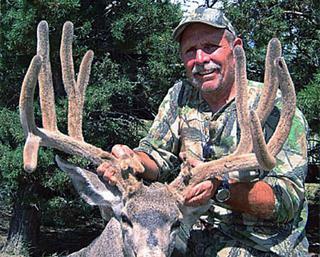 Matt is coming back next fall for an Elk and Deer hunt which will be filmed for his TV show. Wow! Talk about “Point Guard” paying off. Bob Hollis has been a client of mine for many years and as is often the case he has become a very good friend as well. 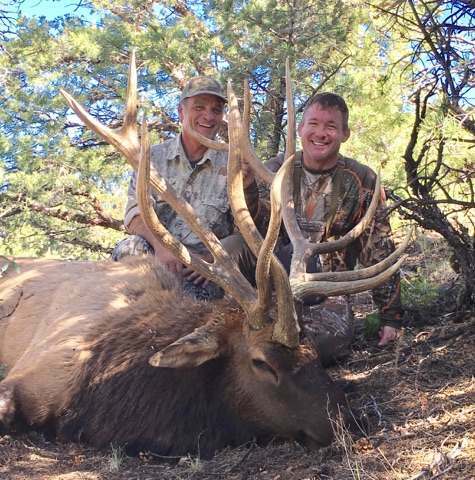 Bob has harvested some very nice bulls with us at Southwest Outdoors in both Arizona and New Mexico over the years and has deer and antelope hunts planned for the near future as well. One animal we had not seriously scheduled is Rocky Mountain Big Horn Sheep. 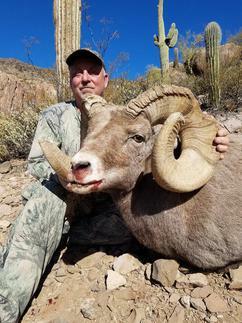 Bob had many Arizona points for this species but even so, his odds of drawing a tag is still very low. As far as Rockies go, I have been advising Bob to apply for unit 23 and 6A because these are my “dedicated Rocky units”. Bob applied for these units the fall of 2017 once again and as usual was unsuccessful. So we were all shocked when Bob called me two days before the start of the season and told me that Game and Fish called him and offered him the one and only Rocky tag in unit 23! It seemed that the previous tag holder had “Point Guard” and elected to forfeit this coveted tag. Bob was checking with me before accepting the tag since the season opened in only two days. I quickly told Bob that my guides and I are more than confident with unit 23 even though we had not specifically scouted for a ram. 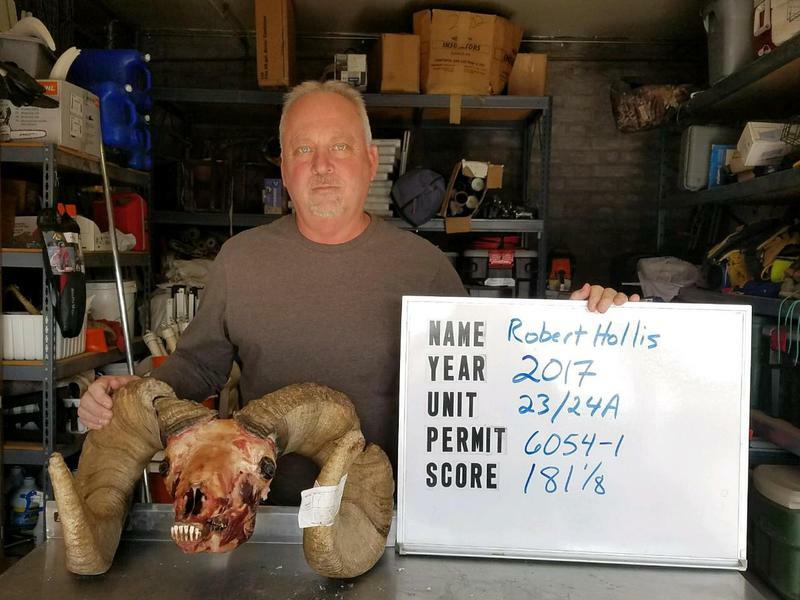 We knew of four rams that we would target. I advised Bob to “hang up and call Game and Fish, the hunt is on”! The challenge with unit 23 sheep hunting is that the sheer size of the unit compared to a relatively small number of sheep. Some sheep units have preferred areas that sheep live in and are much more congregated than in unit 23. Over the years we have glassed a few rams throughout most of the unit, usually one or two rams at a time, in very steep and remote canyons. Day one was spent with several of us spread out in the areas we normally find sheep in, but only Ewes and small Rams were located. On Day two I proceeded to a vantage point I have seen a Trophy quality Ram in the past and I spent the morning without spotting the Ram. At noon I glassed up a band of Ewes and a Ram that looked approximately to be 150. As soon as I spotted them they dropped into a steep draw for shade and I knew I would not see them again for several hours. With the rut in full swing and going strong, I also assumed there would be a larger Ram somewhere nearby. I settle in for the rest of the day. I continued glassing all afternoon until I spotted the Ewes filing out of the ravine at 4:00PM. That’s when he appeared. The last sheep out was a long and heavy Ram. I instantly knew he was a trophy Ram, possibly 180 Boone and Crockett, even though he was close to a mile away. As we watched the sheep feed up the ridge I advised Bob of two things; He was definitely a 180 class Ram and that there was no way to get close enough for a shot before dark. We then made a plan to approach the Ram from the south in the morning, which would put us in a position for a shot. By daylight, Bob and I were headed to a long ridge that would take us far enough East to get a visual on the sheep, or at least to where we had last seen them. As we came around the edge of the ridge we spotted the sheep below us on a rocky ridge top with the Big Ram bedded down on a large, flat boulder. With the Ram still at 800 yards away we elected to drop below the Ram and move in from below which afforded us more cover. As we climbed through the jumble of boulders in the bottom of the ravine we came to a very large boulder that we pre-determined would likely be our shooting position. As I peered over the boulder I saw that the Ram was stilled bedded down on the flat rock and that we would not have a shot until he stood up. For the next several hours we watched and waited for the Ram to stand up and with that much time to observe and judge the Ram, I was convinced he would score over 180. At 10:00AM the Ram finally stood up and turned to the right offering a broadside shot. Bob was instantly set in his shooting position and squeezed off a shot at 500 yards. The Ram leaped off the rock and crashed into the brush below and out of site. I saw the bullet hit behind the lung and knew it had been a lethal shot, but when the Ram suddenly stood up Bob placed a 2nd round behind the shoulder and the Ram was down for good. The Ram was a massive ten year old warrior that scored 181 1/8. Bob sure likes this “Point Guard” system!